Q. When did the studio glass movement start in the United States? Can you show me some early examples? Image: Harvey K. Littleton. Gold and Green Implied Movement. Sculpture. 1987. CMoG 2006.4.112. Hello! Thank you for your question! According to "The American Studio Glass Movement," posted on All About Glass (October 5, 2011) on The Corning Museum of Glass website, "The catalyst for the development of studio glass in the United States was Harvey K. Littleton, a teaching ceramist at the University of Wisconsin in Madison, who became inspired by the pioneering work in ceramics of the California potter Peter Voulkos. Informed by his own background in the material, Littleton started experimenting with hot glass in his studio in 1958." If Littleton's experiments in glass were the catalyst for the studio glass movement, it was the workshops led by Littleton and Dominick Labino at the Toledo Museum of Art in 1962 that are generally recognized as its beginning. There, Littleton, with Labino's assistance, "introduced the idea that glass could be blown and worked by an artist in a studio, outside the glass industry" ("Founders of American Studio Glass: Dominick Labino," October 21, 2011). You can read more about Littleton in "Harvey K. Littleton and the American Studio Glass Movement," posted on All About Glass (October 18, 2011). This article includes links to a number of objects created by Littleton that were featured during the Founders in American Studio Glass exhibition at The Corning Museum of Glass (2011-2013). You can view thousands of photographs capturing people, events, and aspects of the studio glass movement in the Marvin Lipofsky photograph collection, which is held by the Rakow Research Library at the Museum and has been made available online. You might also like to check out "The Chronology and Bibliography of Studio Glass" by William Warmus and Beth Hylen. Though it has not been updated since 2003, it provides important dates and resources about the studio glass movement. It also includes resources to help you learn about more than two dozen contemporary studio artists. To mark the 50th anniversary of the studio glass movement, the Art Alliance for Contemporary Glass (AACG) sponsored two panels at SOFA Chicago in 2012 on "Pioneers of Contemporary American Studio Glass," featuring artists Joel Philip Myers, Toots Zynsky, Marvin Lipofsky, Mark Peiser, and others. Recordings of these panels are available to view on YouTube. In addition to the online resources linked to above, the Library has books, articles, videos and archival collections that can help you learn more about the studio glass movement in the United States. A few of these are listed below, with links to their corresponding records in the Library catalog. Byrd, Joan Falconer. Harvey K. Littleton: A Life in Glass: Founder of America’s Studio Glass Movement. New York: Skira Rizzoli Publications, 2011. Hampson, Ferdinand. Studio Glass in America: A 50-Year Journey. Atglen, PA: Schiffer, 2012. Layton, Peter. Glass Art. London: A & C Black, 1996. Lynn, Martha Drexler. American Studio Glass, 1960-1990: An Interpretive Study. 1st ed. New York: Hudson Hills Press, 2004. The Story of Studio Glass: The Early Years: A Historic Documentation Told by the Pioneers. Copenhagen: Rhodos, 1998. Byrd, Joan Falconer. “Birth of the Studio Glass Movement, 1962-1964.” Glass (Summer 2012): 58-69. Davis, Marcie. “Glasscaster with Marcie Davis: Marvin Lipofsky -- Sharing the Beginnings of the American Studio Glass Movement.” The Flow (Summer 2010): 30+. Myers, Joel Philip. “How Studio Glass Replaced the American Glass Industry.” The Glass Art Society Journal (2012): 53-54. Scanlan, Jennifer. “Flameworking within the Context of the American Studio Glass Movement.” The Glass Art Society Journal (2005): 81-83. Warmus, William. “Harvey Littleton: Glass Master.” Glass, no. 72 (Fall 1998): 26-35. Zynsky, Toots. “Women Who Helped Pave the Way.” The Glass Art Society Journal (2012): 52+. Legacy of Glass. Toledo, OH: WGTE, 2000. In historic footage and interviews, Harvey Littleon, Dominick Labino, and others discuss the Studio Glass Movement's rise and the innovations they pioneered that transformed glassblowing into a celebrated art form. Three contemporary artists Baker O'Brien, Shawn Messenger, and Mark Matthews are also profiled. Studio Art Glass Movement with Marvin Lipofsky, Henry Halem, Audrey Handler, Fritz Dreisbach, Bill Boysen, Roland Jahn. Recorded at the University of Wisconsin, Madison, WI, November 2000. Part of the Marvin Lipovsky collection. 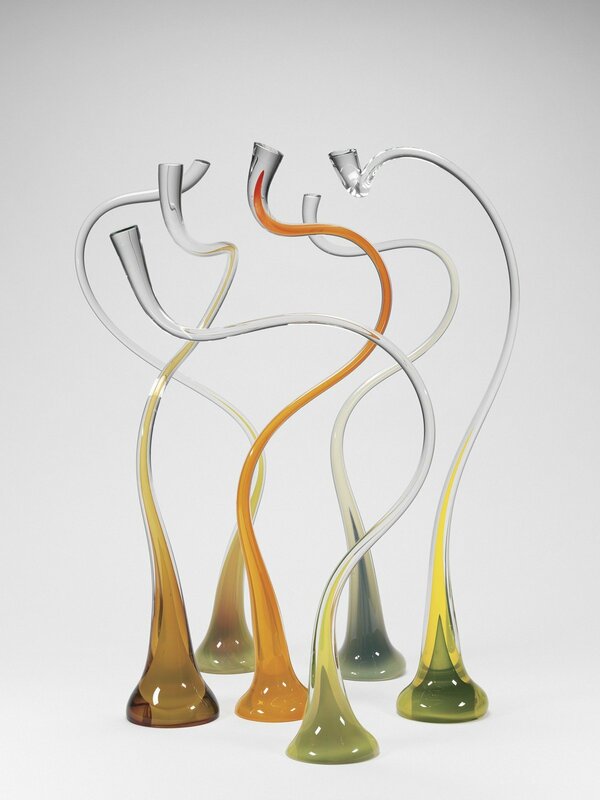 Voices of Contemporary Glass: The Heineman Collection. [S.l. ]: Gemini Media, 2008. A compilation of video excerpts of several different artists reflecting on their work. Each approximately 3 minutes long. A more extensive list of resources is available upon request. Please let us know if we can be of further assistance via Ask a Glass Question (http://libanswers.cmog.org/) or by email (rakow@cmog.org) or phone (607-438-5300). Who were the key women glass artists in the earliest days of the studio glass movement (in the US and internationally)? I am interested in glassmaking in America before 1962 & the studio glass movement, including artists & unions. Influence of Italian glass blowers on American studio glass.